Luxurious twelve-cylinder classic cars duel! 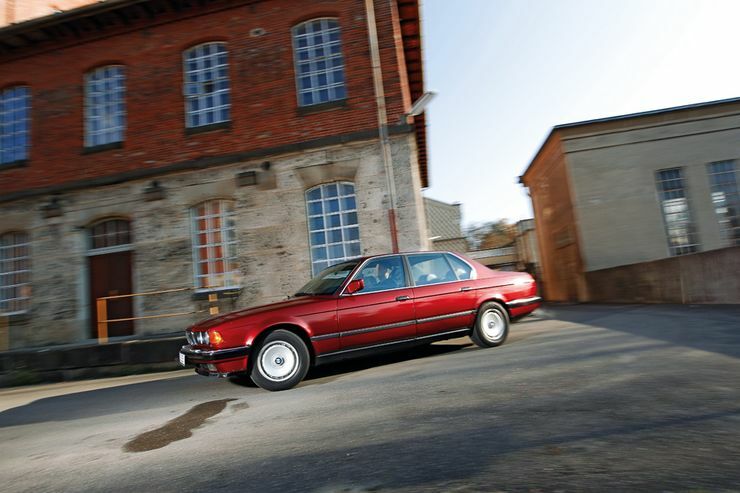 When BMW presented a V12 750i in 1987, Mercedes had no answer for it. 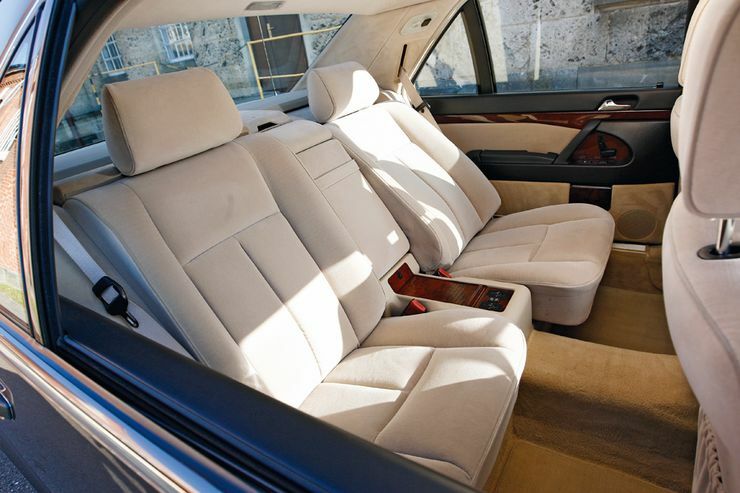 Only in 1991 Daimler adorned the S-Class with V12 power in the guise of the luxury liner 600 SEL W140. Nostalgia test via auto motor und sport. “Mammoth, Dream” was what Mercedes itself called the W140 S-Class. The largest S-Class of all time fit just short of parking garages and car trains, the model’s payload being accidentally estimated 340 pounds too low. The S-Class quickly turned into a malicious caricature. A clumsy elephant, too large for its habitat, greedy for resources. BMW had quietly launched their twelve-cylinder 7 Series in 1987. Square tailpipes, a wider kidney front, forged aluminum wheels, they all hardly made a difference from a BMW 730i. Understated instead of opulent, this 130,000 mark (expensive) car does not split opinion, it reconciles, with its restraint and stylistic elegance. The Germans were again proud of their big car nation, which had everything – Porsche 911 and 928, the SL, a M635 CSi, the Audi Quattro, but just no twelve-cylinder. Traditionally, only the Italians owned this patent at Ferrari and Lamborghini and the British with the prestigious Jaguar sedans. Okay, before the war, there was the Maybach Zeppelin, the Horch 670 and as a prototype the Mercedes-Benz 600 K with a 6-liter V12 and 240 hp. Mercedes-Benz has shied away from the V12 formula after finding success with the spectacular 450 SEL 6.9. 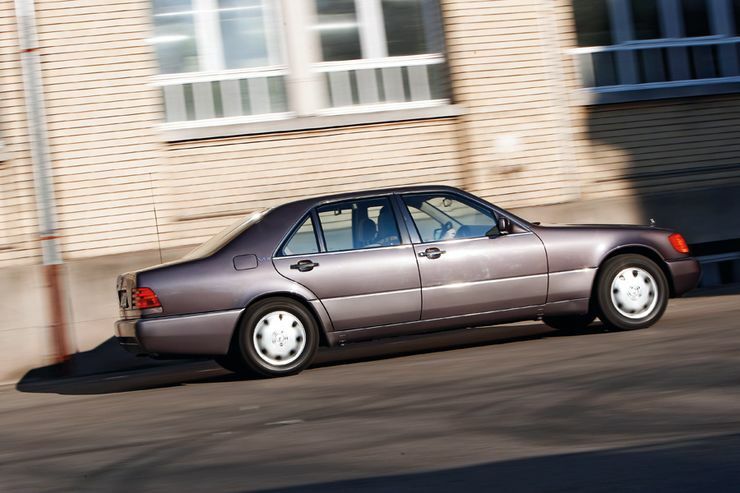 But the successor S-Class W 126 was, affected by the oil crisis, set on a diet with a smaller five-liter aluminum V8. 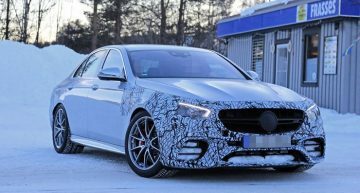 The Daimler Board then decided to extend the development period of the next W140 S-Class project by two years. That had to be enough for preparing a new twelve-cylinder, which could top the Bayern engine. It was planned to have four valves and two pairs of overhead camshafts, six liters of displacement and 400 hp. The goal was reached by using the insanely progressive designed M 104, a three-liter DOHC six-cylinder with adjustable intake camshaft and direct valve actuation. Daimler engine chief Dr. Kurt Oblander had to “just” marry the two six-cylinder by constructing a new aluminum crankcase. However, no 440 PS came out of it, but 408 – enough to turn the two-tonner into a projectile. Maximum speed was limited at 250 km/h. In contrast, the first German twelve-cylinder, the BMW 750iL, celebrated moderate excess in all respects. Its base is the block of the 2.5-liter six-cylinder M20 from the 525i. Bore times stroke is 84 x 75 mm for both engines. 300 hp was considered enough for the M70 V12, along with two valves per cylinder and only one camshaft per bank – again sufficient for an even torque spread and no excessive consumption. 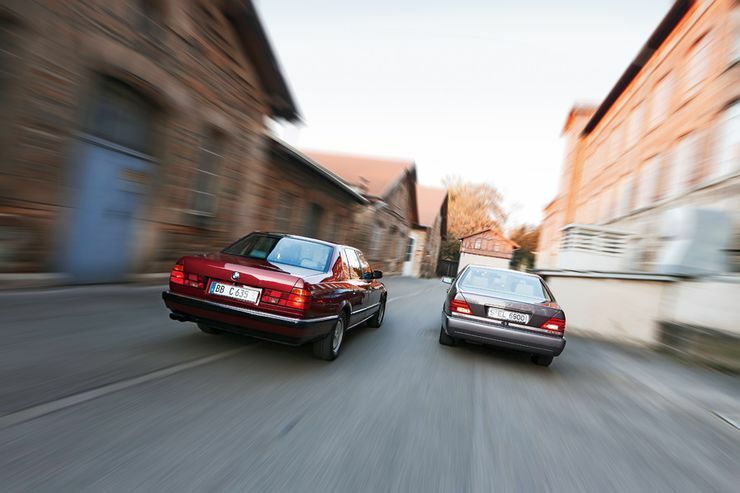 The 750 iL sips 13 to 15 liters per 100 km on average, the Mercedes needs three to four liters more. 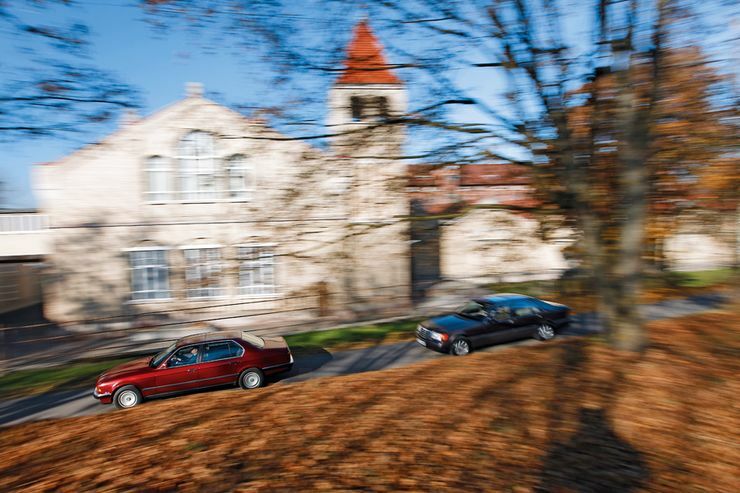 When the W 140 was launched in 1991, the term “socially responsible” was discussed for the first time in connection with a car. Quickly, the majority agreed, the W140 S-Class was simply too much. Especially in comparison with its friendly smiling, twelve-year-old predecessor, the more compact and aerodynamic W126. The interior, finely lined with velour or leather like a V.I.P lounge, the thick double glazing shields like adornments from a real vault. This heavenly comfort does not appear in the rear of the BMW. Suspension, feel and comfort are a class below. But also a Mercedes W 140 wants to be loved, with a bit of effort and the right equipment. The Maybach has replaced him as an off-set representative of the rich and powerful. 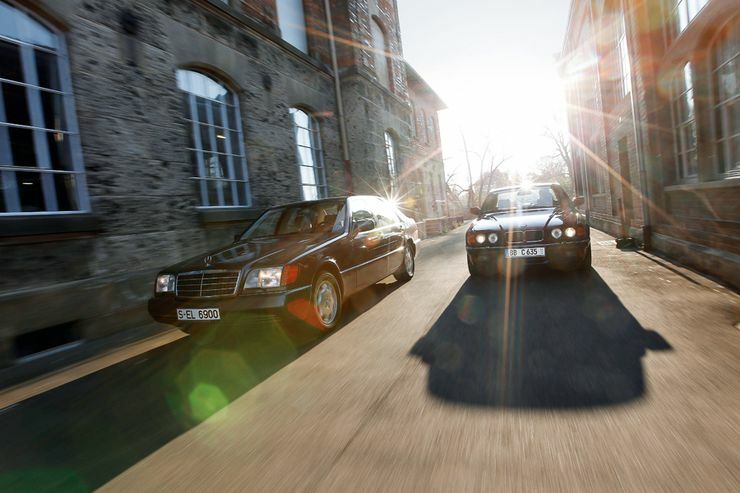 In quality, ride comfort and safety, the W 140 preserves the old Mercedes spirit, to which the new slogan “The best or nothing” perfectly applies. In the past, the Daimler-Benz engineers often shot a little beyond the mark in their penchant for perfection. Ultra-thick doors, double glazing for windows, exterior mirrors that can be folded at the push of a button or the multi-link axle, which operates with five arms and push struts per each wheel and, in combination with a hydropneumatic level control system, ensures optimum ride comfort. In terms of chassis technology, the big BMW is satisfied with the traditional trailing-arm axle. Against the highly bred Mercedes 600 SEL, the 750 iL can’t simply justify its existence, only consumption and handling are better. Satisfaction remains, his V12 is even quieter. The opulent styling is also part of this philosophy. Because the cars around the W140 have become more corpulent, it no longer stands out in the street, a new Ford Mondeo is also 1.87 meters wide today. In the lilac color Bornit Metallic, combined with suede in the color of champignon, the W 140 now manages to present itself as a subtle bohemian. Did we really misunderstand it back in its days? The restrained BMW 750 iL does not have this problem, its subtle understatement makes it more of an instant classic, now and then. Size also seems smaller today. Ignorants would coldly mistake it for a 5 Series. Brilliant calypsorot is a false color that violates the protocol just as well as bornite, but the cosmetic hue subtly intensifies the appeal of the Luthe-penned lines. The Nappa leather in the interior is called silver, not black, in the long sevens it was even standard. In general, the BMW 750 iL had almost every option as standard. Meanwhile, the Mercedes 600 SEL list price of 204,231 Mark can easily be increased to 233,815.50 DM. The BMW is also modest in this discipline. Seven special options push it to 143,370 marks. But, in a class where luxury is all that matters, price is easily ignored. After all, if you have to think too much about it, you cannot afford it!